How does a 500,000-pound jumbo jet stay up in the sky? How many of us really know the answer to that question? We encounter countless phenomena that have perfectly logical scientific explanations-if we only knew who to ask. Award-winning teacher Larry Scheckel spent thirty-eight years explaining how the world works to students. 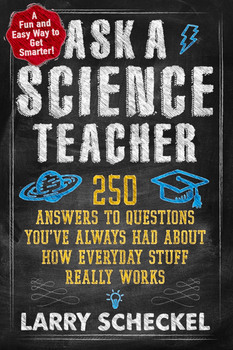 In Ask a Science Teacher, he gives us authoritative and easy-to-understand answers to 250 questions first asked by readers of his regular newspaper column. Topics include the human body, earth science, astronomy, technology, chemistry, zoology, sports, music, and the everyday conundrums that don't fit into any category - science is everywhere, after all, and the best way to discover it is to ask a science teacher.